To me, no Sunday roast (or infact a roast dinner on any day) is complete without a yorkshire pudding. Now I need to go and make some to go with my roast dinner! I hope you have been liking the recipes? Today it is the turn of Crunch! Press the mixture into the tin and add the smarties or chocolate drops on the top pressing in a little. So back on September 1st I began my Thirty by Thirty Challenge where i came up with a long list of thirty things I wanted to do before I hit the big 3-0 and I was going to blog about it. Well, avid blog readers will be able to tell that I have not blogged once about the challenge since. It's not so much that I haven't been doing anything from the challenge, but actually that is kind of true. I have been keeping my journal of something that makes me smile every day however. "Hand Made Tales, curated by Carol Tulloch, is a timely exhibition focusing on the role domestic crafts play in many women’s experiences. It draws on the connections between the current revival of domestic crafts such as sewing, gardening, and cooking and the historical roots of the domestic arts within the home. The exhibition will allow visitors to explore and learn the stories of crafts and the women involved in them through personal tales and fun interactive projects. Come and discover treasures that share the intimate bond between generations from the once mundane to the now treasured heirlooms of families past." I thought the exhibition was a good opportunity to read some of the stories associated with some of the items and items that had been loaned, but I also found some a little bizarre like the jar of jam and the jam pan that didnt really have a story attached to it. What I enjoyed more however was an associated project called Crafted Footnotes by Nicola Malkin as part of the Museumaker project. Malkin created her own versions of domestic items, ranging in scale from the gigantic to the miniature. Her objects, which included a giant bar of soap, a 3D poster and a cluster of ladybirds, formed a trail of ‘hidden stories’. They were placed around the Library, in the foyer, on bookshelves and other furniture, with archive numbers that lead to the relevant sections of the archive. Each of the items related to a story such as the mini porcelain babies relating to the stories of Baby Snatching or the giant tea bag depicting a scrapbook of press cuttings relating to the women in the second world war. What I enjoyed about this section of the exhibition was the way you had to walk around the read room library searching for the items but it was also a creative way to get visitors to look at some of the book titles held at the library. It was a good start to seeing fifteen exhibitions, who knows what the next one will be but I hazzard a guess it wont include giant knitting needles! Well the holidays are fast approaching and something I love about the Christmas season is all of the holiday baking and homemade cooking that taks place in kitchens around the world! I would like to take this opportunity to share my recipe for holiday mincemeat that makes fabulous mincepies. Add the butter to the mixture and mix well. Now you're left with the banana, because the mixture would not keep well with the banana added now, only add the chopped up banana before you are going to use the mixture. If you are not using it straight away then put the mixture into glass jars or an airtight container and store in the cupboard. This mincemeat recipe is great to make with the children to get them included in the holiday preparations and is also a lovely present to put in pretty jars with a pretty ribbon and use as small gifts for friends and family. I'd love to know if you make it and how it tastes! Today is the 11th of November, it's Rememberance Day, although officially it is celebrated on the closest Sunday which this month is the 14th. 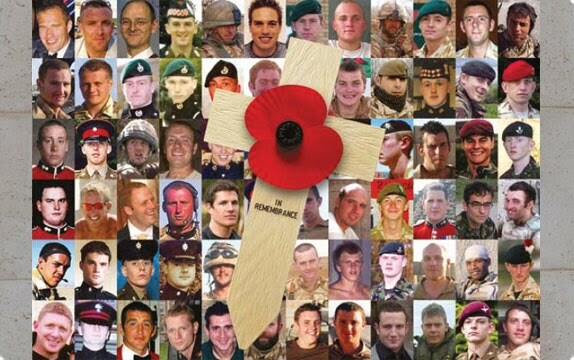 However, today I will be wearing my poppy with pride as I remember. Traditionally Rememberance Day is to remember those fallen in the Great Wars but for me, it's a little closer to home. For the first time, the Royal British Legion have a Field of Rememberance for those who have fallen in the Afghanistan War. The picture above shows just some of those brave heroes who now shine as stars in the sky. You may be wondering why this is so important to me? Well, my big brother is a Sargeant in the Royal Marines here in the UK and he has been for the last 9 years serving in Northern Ireland, Iraq and Afghanistan and he will be going back to Afghanistan again in Spring 2011 leaving behind his wife and gorgeous girls. No doubt I will blog about it when the time comes but for now, I am just doing my small part to raise awareness of the need for support that the familes of those who did not come home need. Now the holiday season is fast approaching there are lots of Christmas theme collections being created on Artfire which is lovely to see! This simple Christmas card with a snowman and the words Let it snow along the bottom is included in a great Let it Snow collection! If you ever find you dont have time for breakfast or want a healthy snack, its good to make up a batch of these bars. With it now being November people are beginning to think about Christmas and the holidays and any presents they might need to buy. Collections on Artfire are also starting to take a Christmassy theme and here are a few I have been included in.